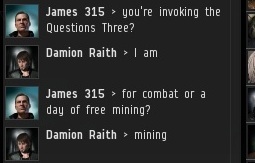 The 24-hour mining pass version of the Questions Three is no different than the Test of Wisdom, one of three Tests a combatant may complete in order to participate in a 1v1 duel against me. I switched to bold text. Halaima local was about to get serious. Here we go again! It was the exact same question I asked when someone invoked the Test of Wisdom in Uotila and later in Kamio. It was answered incorrectly on both of those occasions. Third time was the charm, especially since both of those posts had been on MinerBumping for about a month before it was Damion's turn. ...But charm is not sufficient to pass the test, it seems. 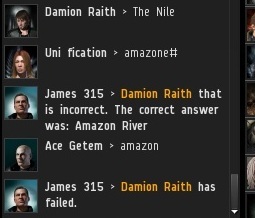 Damion managed to fail in exactly the same way his two predecessors did. 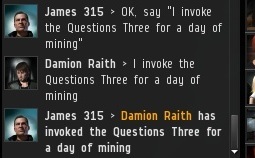 Two miners tried to help him out by shouting the answer in local, but they were too late. The test was over. 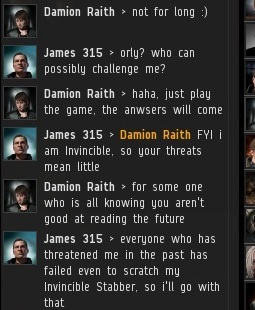 Time to find out whether Damion was good loser or a bad one. 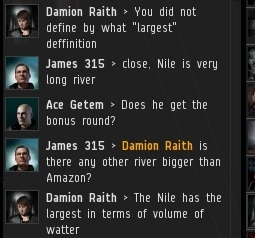 Damion complained that the question wasn't clear enough, and that if measured by volume of water, the Nile would come out on top. The only problem with Damion's argument is that he was wrong. Yet he insisted, confident as ever. What is it with these people? I observed the same phenomenon with people who say bumping is against the EULA: They are wrong and have no particular reason to think they're right, but somehow they're absolutely convinced of it. Damion stressed the "daily" flow of water as the determinative factor. 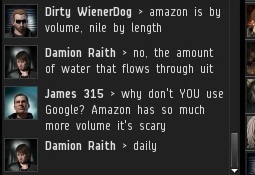 As if the Amazon won on annual flow, but the Nile was more reliable on a daily basis. Denial ain't just a river in Egypt, am I right? Am I right? Damion needed to spend more time studying geography and less time mining ice. After he warped back to the ice field to renew his mining efforts, I bounced him right back out. Academics come first. 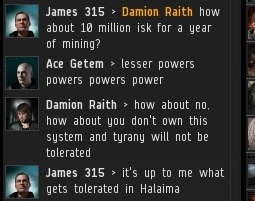 Having failed to win through the Code, Damion sought comfort in the false hope of rebellion, to which so many miners fall victim. He uttered dark threats about powerful friends coming to destroy the New Order. 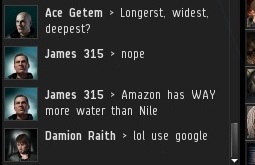 Could such a thing occur, or would Damion resume whining about the Nile River? Next time: The exciting conclusion! 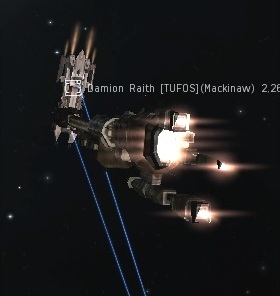 They still fail to see you are invincible because of CCP hisec rules, and this rules are the direct result of the constant whines of carebear community.